Dislocated thumb for Beas? Uh oh. Is that what it was? The way he was dangling his arm I thought it was a stinger or nerve issue. Not sure. I saw the arm dangle, but heard Stu and Mac mention a thumb. Hard to tell if he was dangling the arm because of the thumb or the arm. Zo was pretty good, not awesome. Luke is in the bottom half of coaches if there were rankings for them. We ain't winning (bleep) with him in charge. I thought Zo played great in the 2nd half. his shooting was awful but in every other area in the 2nd half he was really good. He made an impact and if he hadn't gotten 5 fouls the game might have been different. We went on a run with him on the floor, as soon as he goes out we lost all momentum. 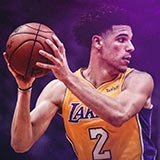 I dont look at the pts when it comes to Lonzo thats not where his strenght lies. I'd be happy if he averages 15/8 in his career with respectable percentages along with great Defense and hustle plays.